2 Day Murchison Falls Mini Wildlife Safari Uganda - A two day taste of a Uganda Wildlife Safari Murchison Falls also referred to as Kaberaga Falls - Uganda's largest park - The perfect Safari to track animals, see birds, take a wildlife - birding cruise on the Nile up the bottom of Murchison Falls itself. 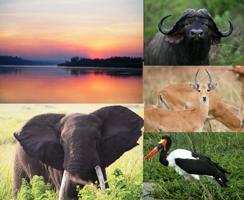 Go with Lifetime Experience Safaris – When it comes to Safari Travel, we know you have a lot of choices. Murchison Falls National Park offers one of the best all around Safari Experiences in Uganda. The Park has steadily recovered from the bad old years of the 1960s. - From fishing the Nile for the huge Nile Perch to the viewing of elephants, giraffe, baboons, hippos, buffaloes, antelopes of various kinds, lions, warthogs, hyenas, leopards, hundreds of species of birds, including migratory ones, storks of various kinds such as the elusive shoebill stork, reptiles, butterflies and a savannah that is beautiful, forests that just make you want to take a hike, and then there are the falls, absolutely fantastic. If you have only two days to spare, Murchison Falls National Park in Uganda is the place for you to go and experience your African Safari. Two days in the African Wilderness. The morning starts early as we begin our 2 day Uganda Safari. We begin our journey driving northward to Murchison Falls National Park through Masindi. Before Masindi there is the option of adding on the Ziwa Rhino Sanctuary, a large preserve where Rhinos are bred in an effort to restock Murchison Falls National Park with Rhinos (the last one was shot in 1982). That’s just to aid you give it a thought - but it’s not something to consider in this 2 day programme as it may lead us miss out on other scheduled park activities. As we enter the park we go the top of the falls that make Murchison Falls National Park so famous. This is a place for most memorable pictures and a taking in of the sounds and sights, including the a rainbow that does not disappear - created by the mist of the falls. The top of the Falls is spectacular, being so close to the FALLS and hearing the roar and seeing the splendor from the top is such a wonderful experience. 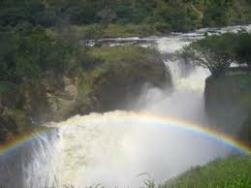 Murchison Falls is “A sneak peek into Heaven”, you realise “the anger of the Nile”. Its is a true master piece of nature. In a small space a million cubic meters of water from the Nile squeeze themselves through the Albertine gorge as they make their way towards Egypt.The river is 50 meters wide and goes through a 7 meter wide gorge plunging down 45 meters creating that roaring sound that will stay with you. Something you will never forget and there is something about standing alongside the mighty River Nile. We then drive to the lodge and check in at the Murchison Falls accommodations that you selected, choosing from budget, moderate or up-market. There is the very basic Red Chilli Camp, Mid-range - Pakuba Safari Lodge and Up Market on lower end Paraa Safari Lodge as you may see by clicking on the "Murchison Falls accommodations" link above. Settle into room, then lunch. After lunch it is off to one of the major highlights of Murchison Falls National Park, motorized boat ride on the Nile River to the most powerful falls in the world, viewing crocodiles, the many hippos along the bank and in the river, the birds, monkeys, buffaloes, elephants and so much more and of course the bottom of the falls. It is one of the best wildlife experiences in Uganda. You can also choose to do the hike from the water's edge up to the top of the falls if you missed it at the time of arrival into the park. the hike costs a few dollars and It is well worth doing. Depending on the time you return from the boat cruise and how strong you are feeling, you can do a short (1 or 1½ hrs) game drive, - no game game drive is the same in nature, whether short or long....they are all different. An early morning breakfast and its off for a the early morning game drive across the savannah, along Lake Albert Delta, abundant wildlife as you move slowly as the sun rises. It’s your scheduled game drive with a Uganda Wildlife Authority (UWA) ranger. Welcome to Africa. What you are sensing and feeling, seeing around you cannot be replicated anywhere else in the world, this is Murchison Falls with its birds, Lions, elephants, hippos, buffaloes, warthogs, giraffes, humorous appearing warthogs, this is Africa and you are on safari in the heart of it. We have prepared the above rates basing on average nightly room rates of lodges in the area. Actual price could be lower or slightly higher depending on the accommodation of your preference. Be sure to understand whats included in the price and whats not. We can always make amendments to suite your interests. 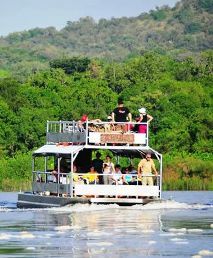 Feel free to contact us any time and book this 2 day Mini-Safari to Murchison Falls Park. We are here to answer any questions you may have. Whether its safari itineraries, competitive pricing or general information on any of our services/tours, we are just a phone call or few clicks away, shoot us an e-mail today, ...we look forward to hearing from you.